Fiona Boyes has enjoyed a strong measure of success over the past few years. Her 2006 release, Lucky 13, was nominated for a Blues Music Award for “Contemporary Blues Album of the Year” in 2007, then she received a nomination for “Contemporary Female Artist of the Year” in 2008 and a nod for “Acoustic Blues Album of the Year” the next year for Live From Bluesville, recorded with Rich DelGrosso and Mookie Brill. The native Australian has also become a crowd favorite at blues festivals at many North American blues festivals with her powerful guitar work, her seasoned vocals, and her versatility. Boyes’ latest release, Blues Woman, is her second release for Yellow Dog Records, and it features her in electric and acoustic settings, with guest stars Marcia Ball, Pinetop Perkins, and Watermelon Slim. Boyes wrote most of the songs here, including the opening cut, “Woman Ain’t a Mule,” which is an ode to female independence. “Howlin’ At Your Door,” features that droning hypnotic Mississippi hill country groove, and the lusty “Got My Eye On You” has a Chicago flavor, with Boyes providing some stinging guitar fills reminiscent of Otis Rush as well as some impressive slide guitar, and “Do You Feel Better” is a slice of Memphis soul. “The Barrelhouse Funeral” is based on a true story and features the irrepressible Watermelon Slim livening up things with his harmonica and his narrative as the “Preacher.” The acoustic “Place of Milk and Honey” sounds like vintage Fred McDowell with more great slide guitar. Another acoustic track, “Juke Joint on Moses Lane,” also features a fine performance, this time on resonator guitar, and the closing track, “Old Time Ways,” features the ageless Pinetop Perkins on piano. There are also two covers on the disc; J. B. Lenoir’s “I Want To Go” is transformed into a lively acoustic boogie track from its sober original version, and fellow Australian blues musician Chris Wilson’s “Look Out Love!” is an appealing shuffle that features Slim on dobro. Recorded in Austin, Blues Woman also features Derek O’Brien on guitar, Jimi Bott on drums, Nick Connolly on piano and B-3, and Ronnie James on upright bass, and Al Gomez on trumpet. 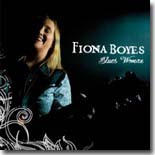 The last three years should have proved without a doubt that Fiona Boyes is a force to be reckoned with in the blues world, but her latest release should remove any lingering doubts. The next time I see Fiona Boyes I am going to have to thank her for shaking the rust off of my listening ears. So many of the records that come across my desk for review are formulaic in nature and Fi’s newest release on Yellow Dog Records, Blues Woman, is definitely not that. Surrounded by some of the best players Austin, Texas has to offer, Fiona takes us on a musical journey through a number of tunes that more than substantiate that she truly is a “blues woman”. So let’s get to it. Our next song, “Howling at Your Door,” is based on an early love letter Fiona received from Steve. Heavily influenced by the Hill Country style of Robert Balfour, Fiona’s dark lyrics have her knocking at Steve’s door. “Well I want you baby….Lord, I want some sugar too…I’m howling at the moon, baby…howling out for you!” The rest is history and that’s all I’d better say here! “I Want to Go” is Fiona’s version of the JB Lenoir classic song. “Hey there little old boy…sit down on my knee…well, I’ve got something to tell you…how you’ve been sending me…and it makes me want to go!” Accompanied by Ronnie James on bass with Jimi Bott playing bongos and a plastic garbage can, this tune is definitely indicative of Fiona’s eclectic style of blues. Fiona openly admits she’s not good dealing with conflict in her liner notes and those feelings form the foundation for her next tune, “Do You Feel Better.” “It takes two to make a heart break…just like it takes two to make it right…its all about an eye for an eye…a tooth for a tooth…I’m doing my best to try and understand…believe me, that’s the truth.” Derek O’Brien lends a beautiful guitar solo to this tune to go with Kaz’s tenor sax solo and hopefully all will end well for Fiona. Probably the cleverest tune on the entire record is the rowdy “The Barrelhouse Funeral.” Opening with Watermelon Slim as the preacher delivering remarks is a brilliant idea, and this tune sparkles from beginning to end. “Well the ramblers, the gamblers and the fornicators…they took exception to what was said…oh, they quit praying right away for the living and the dead…grabbed the preacher…hit him upside the head…and told him to turn the other cheek!” Very well done, "The Barrelhouse Funeral" is a classic Fiona tune. Up next is “Place of Milk and Honey,” a tune dedicated to the influences of Mississippi Fred McDowell. Jimi Bott’s washboard work is clearly heard and lends a very authentic touch to Fiona’s need to make some money to be able to head back home. “My pocketbook…man, if I don’t make some money…I can’t make my way back home.” Fiona doesn't receive enough credit for her guitar playing and you can hear why she should with her acoustic guitar playing on this tune. A song with old roots, “Waiting for Some Good News,” is our next tune. Given all the turmoil in the world we all could use some good news. “I’m checking my mail three times a day…for something that will drive my blues away…I’m just waiting for some good news!” I wasn’t aware that Kaz played harmonica but his harp work on this tune stands out as a real treat and helps to set the mood for what hopefully will be Fiona receiving some good news! Fiona reminds us all that life is short and it takes work to determine whether any kind of relationship, personal, work or otherwise will succeed. “With stars in my eyes…while you told me pretty lies…the way you did me ain’t the right thing to do…so I’m thinking about my precious time…and I don’t want you wasting any more of mine…cause, I work too hard to let a man like you…waste my precious time!” “Fishing Hole” is a tune heavily influenced by Bobby Rush’s tune "Night Fishing" and represents Fi’s take on fishing. “Let’s go…you have a wet line…cause you’ll never find…a fishing hole that’s better than mine!” Do you think they caught some fish? In “City Born Country Gal,” Fiona tells us about her roots. “I ain’t never lived in the country…baby, I never will…but I’m as down home baby…as a whiskey still.” That pretty much covers Fiona. She’s as down home a person as anyone I’ve ever met on the Blues Highway and definitely a treat to know. There’s a classic blues club in Tallahassee, Florida called the Bradfordville Blues Club and our next tune, “Juke Joint on Moses Lane,” is a tribute to it. “Hmm…yeah…I can hear the call….and I can’t wait to get there…my old friends hanging on the wall…going down to Bradford…going to have myself a ball!” This is definitely a club that Fiona has fond memories of and one that has a steeped history in the Blues. If one is judged by the company they keep, then Fiona is in very good company on Blues Woman. Ably produced by Kaz Kazanoff with appearances by Pinetop Perkins, Marcia Ball, Derek O’Brien, Ronnie James, Jimi Bott and the Reverend himself, Watermelon Slim, Fiona has put together a very eclectic album that does an outstanding job of showcasing the many Blues influences that impact her writing. This is a record you definitely have to listen to and one that will reward you for doing so. For those of you not familiar with Fiona, check out her website at www.fionaboyes.com or her label’s website, www.yellowdogrecords.com. Fiona and the Preacher moved back to Australia from Portland and we don’t get to see her as often as we’d like, so if she comes to town go see her. You’ll be in for a rare treat.